Editor's Note: This is a part of a series of stories highlighting those impacted by breast cancer during the month of October, in recognition of Breast Cancer Awareness month. 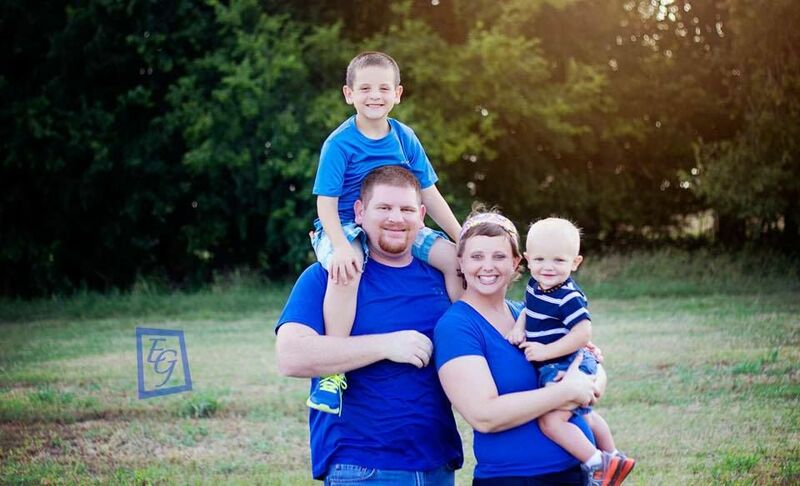 As this year ends, Carrie Couch of Grove is counting her pennies and blessings. She is ending the year enrolled in a clinical trial designed to help prevent the reoccurrence of breast cancer, thanks in part to an organization known as Pennies In Action. The clinical trial, with Dr. Brian Czerniecki, is based at the University of Pennsylvania. It uses a patent's own white blood cells to create a vaccine, which is then used, as Couch describes it, to remind her white blood cells how to fight off disease. In all, 2015 is ending better than it started for Couch, who started the year anticipating a completion of treatment for HER2-positive breast cancer. The pre-kindergarten teacher at Turkey Ford Elementary planned to finish her radiation treatments and return to the classroom and students, hoping her days of chemotherapy and radiation were behind her. She had already underwent multiple rounds of chemotherapy and a bilateral or double mastectomy. She was scheduled to complete radiation treatments on Jan. 27. All signs pointed to having good reports from her oncologist. Then things changed. As Couch returned home on Jan. 27 from her last treatment, she experienced first of at least two seizures. The first at home, the second at INTEGRIS Grove Hospital. After an assessment at INTEGRIS, doctors transferred Couch to Joplin, where tests showed that her HER2-positive breast cancer had metastasized, causing a brain tumor. Her cancer had progressed from Stage 3B to 4. According to doctors, HER2-positive breast cancer is a breast cancer that tests positive for a protein called human epidermal growth factor receptor 2 (HER2), which promotes the growth of cancer cells. It makes cancer cells multiply at a faster rate. Because of the high growth rate, doctors later told Couch it's common for the disease to metastasize into a patient's bones, lungs or brain. Two days later, instead of having an end-of-treatment party with members of her bible study, Couch found herself undergoing another surgery - this time to remove her brain tumor. Since then, she has completed 10 rounds of brain radiation and finished a year of chemotherapy treatments. One night, while surfing a Facebook support group for breast cancer survivors, Couch saw a post about Pennies In Action and a series of clinical trials taking place at the University of Pennsylvania involving immune restoration therapy. Couch completed the form on the foundation's website, outlining her story and treatment. "I filled it out randomly," Couch said with a smile. "I've never done anything like this before. I just thought, 'what's it going to hurt.'" A few short hours later Uschi Keszler, the organization's CEO, called Couch for her medical records. She indicated that Couch was a strong candidate for the study. Couch said Keszler started the organization after talking with her grandson about the need for cancer research and funding. Her grandson gave her two pennies from his piggy bank and the idea for the group was formed. Pennies in Action is based upon the belief that one does not have to be wealthy to have an impact on raising funding. "The amount one person may give may be relatively insignificant, for a penny alone has little value, but many pennies make many dollars," the group's website states. "Success in funding the research and the power to make a difference can come from just a few pennies if everyone takes part in even a small way." Since that initial phone call, Couch has made multiple trips to the University of Pennsylvania to meet with Keszler and Czerniecki. On the first trip, which was delayed by this summer's heavy rains, staff drew Couch's white blood cells to create the vaccine. Since then, she has returned to Philadelphia six additional times to receive the shots. On Monday, she returns to Philadelphia to have the blood drawn to create the final three shots. She will receive them in December of this year and February and June of 2016. Funding for the first airfare to Philadelphia came from friends hosting fundraisers and through private donations. Since then, Couch has received financial assistance through the INTEGRIS Grove Hospital Foundation cancer fund. "It's been amazing," Couch said, of the assistance from INTEGRIS. Couch hopes the vaccine she receives in the trial will help her body continue to fight off a recurrence of cancer. Funding for the trial, which costs up to $33,000 per patient, comes from the Pennies in Action foundation. As of now, tests indicate there is no evidence of cancer in her body. For the next year, she will undergo a brain MRI on a regular basis to ensure the tumor does not re-develop. Couch sees the clinical trial as a bonus treatment, rather than a replacement for chemotherapy and radiation. "My oncologist told me if he was in my position, he would do exactly the same thing," Couch said. "I was beyond excited to get into this trial. The treatment is individualized." Couch encourages other cancer survivors to research and find out if they may qualify for one of the thousands of clinical trials taking place throughout the country. "Without the woman who posted this - I haven't been able to find her since then - I wouldn't know about this trial," Couch said. "You just have to find the one that fits you." Carrie Couch has received funding for her trips to the Univeristy of Pennsylvania from the cancer fund through the INTEGRIS Grove Hospital Foundation. Monies donated to the cancer fund are used to help patients with costs associated with their treatment. One hundred percent of the funds donated to the cancer fund are used to help patients. This story initially appeared in the Oct. 23 issue of The Grove Sun. Bits & Pieces: Got Supper?